Mmm cinnamon buns are among everyone’s favorite ooey gooey treats and these cute cookies look exactly like tiny frosted cinnamon buns! These cookies are very simple to make and look delicious with very little effort! We used our NEW Pure Cinnamon and Vanilla Extracts to flavor these cookies. Cream the butter, sugars, salt, orange zest and World Class Madagascar Pure Vanilla Extract Single-Fold on medium speed until light and fluffy, 4 to 5 minutes. Add the egg, scraping down the bowl after it’s fully incorporated. Reduce the mixer speed to low. Add the flour all at once and mix just until combined, about 1 minute. Roll out the dough on a lightly floured surface to a square about 12 inches. – you can also do this between two sheets of parchment paper. Cinnamon Paste: Mix all the ingredients on medium speed until smooth, about 2 minutes. Scrape down the bowl as needed. Spread the paste on the dough and roll up into a tight log. Wrap the log in plastic wrap or parchment paper and freeze until firm, about 15 to 20 minutes. Slicing and Baking: While the dough is chilling, preheat the oven to 375 degrees F. Line two baking sheets with parchment paper. Using a sharp knife, cut the log into 1/4-inch-thick slices. Transfer the slices to the prepared baking sheets, spacing them about 1 1/2 inches apart. Bake 12 to 14 minutes until the edges are golden brown. Rotate and switch the baking sheets as necessary for even baking. Allow the cookies to cool for a minute on the baking sheets then transfer to racks for cooling completely. Make the icing: Combine all the ingredients in a small bowl. Drizzle or lightly brush a thin layer on the surface of each cooled cookie. Let set before serving or storing in an air-tight container. 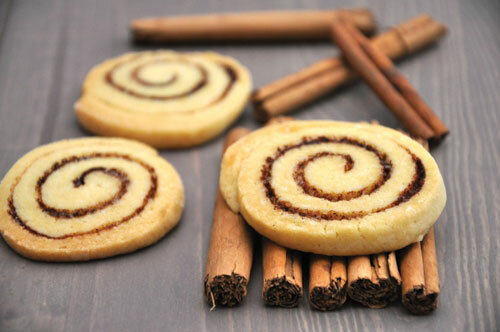 Show off your sweet homemade cinnamon bun cookies in our crafty cookie bags! This fun set includes 10 cookie bags, tags that say “Homemade”, mini clothespins and a recipe card. This entry was posted in Uncategorized by Fancy Flours. Bookmark the permalink.